New Browse Find the Vine on your mobile phone or PDA, from the restaurant or the dinner party. We detect that you're on a mobile device and present a simpler, faster edition. Find out what grapes are in your wine. 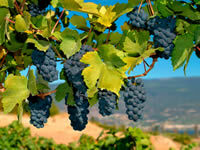 Find out what wines contain the grapes you like to drink.